Many of you love to have Eggs . Eggs are powerhouse of nutrition packed with protein and many vitamins and minerals. 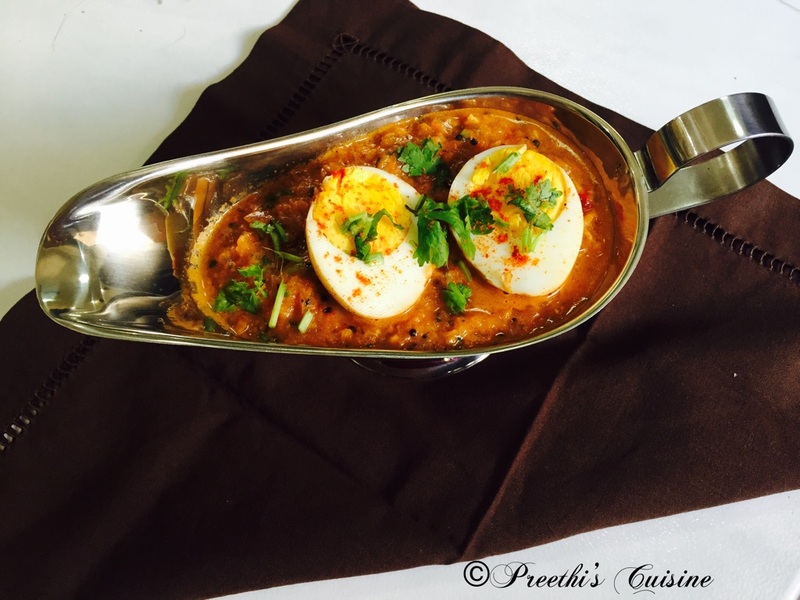 My Kids love to have eggs and their favorite dish is Egg curry. I try to make something different each time. This time I made egg curry (Andhra Style) that is spicy and tangy. It was finger licking good. Heat 1 Tsp of oil in a wok. Add ½ Tsp Red chilli powder and salt and shallow fry the eggs for 2 mins. Keep the shallow fried eggs in a plate. In the same wok, add the finely chopped onions, ginger and garlic. Once the onion turn slightly brown add the finely chopped tomatoes. Divide the mixture into 2 parts and allow it to cool. Once the mixture is at room temperature, grind one part into fine paste. In the same wok , add a tsp of oil, add mustard seeds, dry red chilli, curry leaves, turmeric/haldi, add the second portion of the roasted onion and ginger garlic. Add the onion paste and roast for 10 seconds. Add Cumin/ Jeera powder, Coriander/ Dhania powder, balance red chilli powder, tamrind paste and mix well. Add ½ cup water and let it simmer for 5 to 7 mins. Add sugar and salt to taste. Cut the eggs into half and add it to the simmering gravy for 3 to 4 Mins. Serve it with Phulkas/rotis or rice. Looks fabulous.. I love ur presentation.. Thank you Natalia. Do try this if you eat eggs now and I am sure you will love it. Thanks Brian.Do give your feedback whenever you try. Oh, this is one fine looking dish. 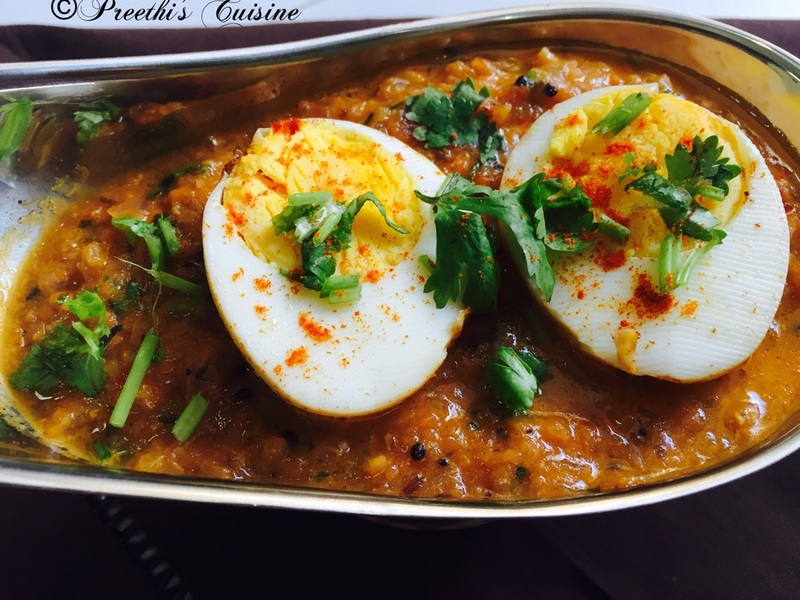 I love egg curry, but have never seen it prepared this way before. I’m going to try this, but I’m going to use quail eggs instead. Thank you. Do try and give your feedback. Thanks Madiha. You can replace eggs with Mushroom or Non veg too.In case you try this recipe for gravy do share your feedback. Always love a great egg curry! 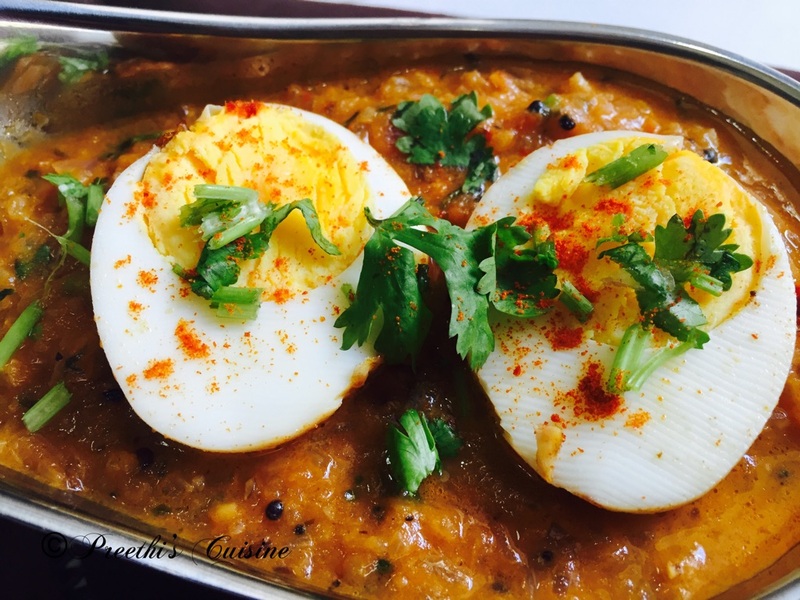 Thanks for sharing it with me over at #MonthlyMasala!